Set down that thirst-quenching craft beer and look up from that mouthwatering burger. No, really. Look UP. At Harry’s the writing isn’t on the wall, it’s on the ceiling — in the form of $1 bills! For years, patrons to “The Kettle” have filled the ceiling tiles with dollar bills adorned with birthday wishes, memorials and messages commemorating their visit to this Wabash legend. Got a group that wants to get up there? Talk to Harry on your next visit. From its modest beginnings as a drive-in diner, to its days as the “Iron Skillet” and “Howdy Bob,” the distinctive, building at 1633 Stitt Street has appealed to both locals and visitors for over 50 years. 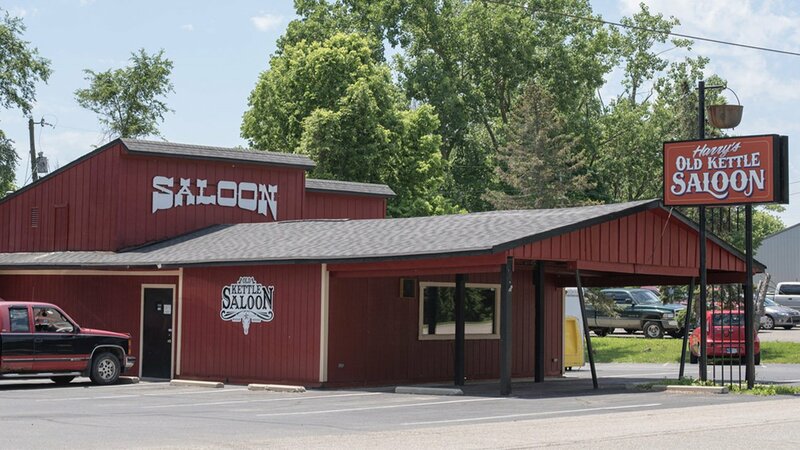 Purchased in 2013 by Wabash residents Harry and Judy Kilmer, the place has retained the friendly, comfortable atmosphere for which generations of Wabash residents have come to know it. As a local chef, Harry always wanted to own a restaurant. 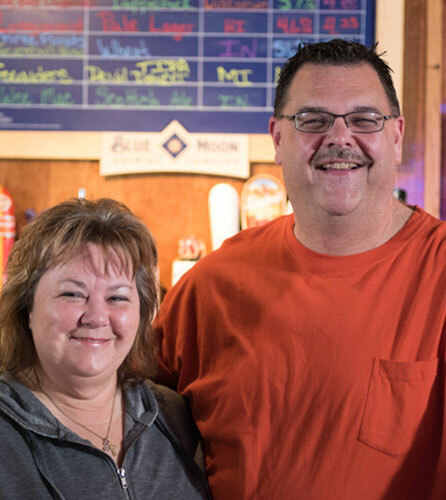 As an east coast transplant, Judy’s fantastic Boston accent makes her a favorite behind the bar (even if she IS an ardent Patriots fan in a sea of Bears and Colts supporters). Together, they’ve worked hard to maintain the spirit that “The Kettle” has always been known for — a comfortable, safe place to come and enjoy yourself. Keeping the name the same while putting their own little twist was part of that. “I wanted to show respect for the bar and didn’t want to make big changes,” says Harry.